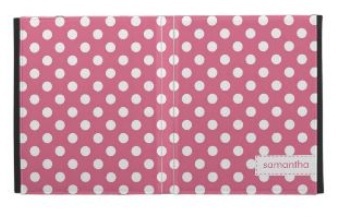 Girly Pink polka dot ipad case designs - Oh So Girly! These cases are suitable for Apple’s ipads 1, ipad 2 and ipad 3 and where there is text, the writing is 100% personalizable. This personalizability is one of the unique aspects of buying an ipad case on Zazzle. They are 9.87″ x 8″, made of water-resistant fabric, wrapped over a hardcover exterior with elastic strap closure. The interior is suede and contains a document pocket, and there are also rubberized edges to create a folded viewing stand.